The warm, brassy tones that are found in many hair shades – especially in brunettes can be quite appealing and give a certain light and dimension to tresses. However, for every person who loves their brass, there is a league of others who want to just get rid of it. Unwanted brassiness can diminish the look you’re going for or even make it impossible to achieve. That is why I’ve pulled together this guide to everything about brassy hair. When unwanted brass shows up on a person’s head, their first instinct may be to head to the nearest beauty supply store for a toner. Toners, for sure, combat brass’ presence in hair to achieve a cool-toned and even appearance. However, they are expensive and can lead to some serious hair damage. Instead of dumping your funds into these products, consider a homemade approach instead! Continue reading to learn a thing or two (or more!) about your brassy hair woes and how to put an end to them. What Does it Mean to Have Brassy Hair? “Brassy” is perhaps not the most descriptive term, so let’s take a moment to discuss what it means to have brassy hair. People who have lightened their dark hair tremendously often have to deal with this problem, but you don’t have to be going blond to experience it. Your hair may also turn brassy if you’ve previously colored or highlighted your locks. Why Does Your Hair Look Brassy, Anyway? When your hair is lightened by salon-quality products, your hope is that the products will lift the pigment entirely from your hair. 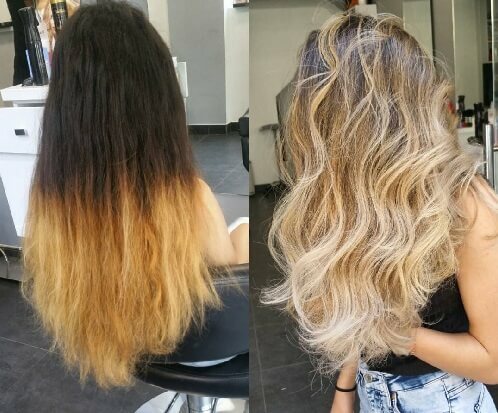 Unfortunately, it is rare that a single bleach session in your stylist’s chair will completely lighten you to the cool, blond tone that you crave. Existing pigment often gets left behind after that first session, resulting in the presence of warm red, yellow and orange where it isn’t wanted. If you are trying to lighten black hair, for instance, you can expect to see some deep orange or even red. If your hair is already a shade of blond and you want to elevate your blond tresses further, yellow tones can prominently appear. This is a normal and expected part of the lightening process, but that doesn’t make it any more attractive. Blue tones, which are present in most hair, lift faster when introduced to a lightening agent. The blue color molecules are much smaller than the molecules of the warmer tones, so they depart tresses in a much timelier fashion. Warmer molecules are larger and therefore more stubborn, making them more difficult to lift with even the highest-quality salon product. How Can You Prevent Brassiness from Affecting Your Look? As it goes with most things, prevention is much easier than finding a solution after the brass has shown itself. 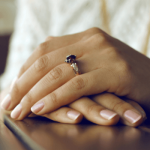 If you’re nervous about brassiness showing up after you’ve spent your hard-earned funds at the salon, don’t fret! There are a few things that you can do to minimize the presence of these unwanted warm tones, including some steps that can be taken long before your stylist breaks out the lightening agent. 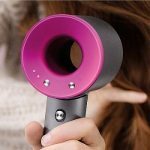 They’ll be able to point out issues concerning the health of your hair, including dryness, breakage, split ends and oiliness that could impact the lightening process. Minimize your use of heat styling tools, like curling wands and flat irons. Use a store-bought or homemade hair mask to bathe your hair with much-needed moisture. Avoid washing your hair more often than is necessary. It never hurts to have an excellent dry shampoo on-hand. Always condition your hair after washing it. Yes – always! Keep your processing appointments (perms, coloring, relaxing, professional straightening, et cetera) at least eight weeks apart, allowing your hair time to recover and minimize damage. Many homes are impacted by hard water, which contains minerals that may deposit on your clothes, in your pipes and, eventually, into your hair when you take a shower. These mineral deposits can discolor and dry out hair, making it not only less healthy but also not the color that you may have intended. A water filter in your shower can significantly improve the look and feel of your hair. 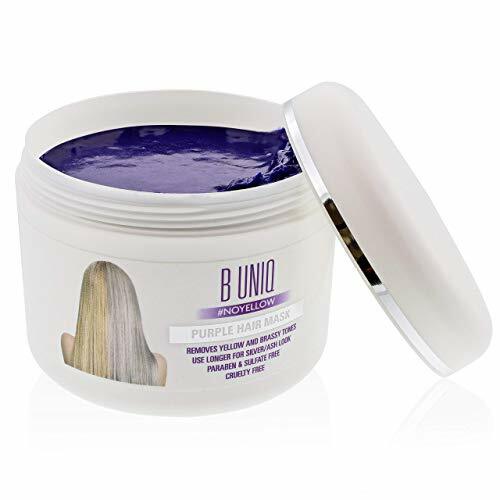 In my blond days, I couldn’t sing the praises of purple shampoo enough! These nourishing and brass-busting shampoos really do the trick if your hair is light enough, but they can deposit color over time, so it’s best to use this type of product once a week or less. It’s really simple: wet your hair, massage in the purple shampoo, wait a few minutes, rinse, and then condition! This is a time-efficient and effective way of managing brassiness between salon visits. Is brassy hair already a problem for you? You’re definitely not alone! But don’t despair, and don’t bolt out to the nearest beauty supplier either! Instead, consider these seven powerful and hair-health-friendly means of ditching the brass in favor of a cooler, calmer shade. How To repair damaged hair with Olaplex 3? 7 easy homemade toner for brassy hair – Tried them All- Verdict Time! It’s without a doubt that professional toners are loved for a reason – they work! But you don’t have to shell out the big bucks or make a drive to your beauty supplier to get great results from a toner. In fact, you can make your own toner in the comfort of your own home, often with things that you already have just lying around! Don’t believe me? Check out these seven awesome (and arguably unexpected) homemade toner recipes. With only four tablespoons of apple cider vinegar and two tablespoons of water, you can create your own toner in no time. Why apple cider vinegar? The acidity! The acidic quality of the vinegar obliterates yellow and orange tones. All you have to do here is mix the two ingredients, which are all-natural and hair-healthy, and apply them to your hair. Let it sink in for about fifteen minutes before rinsing with lukewarm or cool water. This can be used more frequently than the baking soda mixture above, but it’s not recommended to exceed two treatments a week. Apple cider vinegar, while ultimately healthy for hair, can cause dryness if used excessively. Editor’s note: It smells but it worked for me. After 15 minutes my hair became a bit lighter and less orange. Got Some Time? How About a Lemon? Lemons have been used to lighten hair for some time, but you can also harness the power of a lemon to create a great toner! Fill ¼ of a cup with fresh lemon juice and ¾ of a cup with water, then get yourself two tablespoons of honey. Combine the ingredients into a spray bottle and then shake it to make sure that everything is thoroughly mixed. From here, all you have to do is spray your hair with the solution you just made and wait for two hours. For the best results, spend at least thirty of those 120 minutes in direct sunlight. Sunlight amplifies the lightening and toning effects of lemon. Rinse, wash, and condition as you normally would. This works so well because honey is a great lightening agent, to begin with. When combined with the acidity and vitamin C found in lemons, these two components create a brass-busting superhero! Editor’s note: I guess I saw a bit of change but does it worth spending 2 hours doing nothing? Not for me. This recipe makes use of apple cider vinegar and then amplifies its toning properties with hollyhock herbs. Hollyhock has similar lifting qualities. With only two tablespoons of apple cider vinegar, a cup of water and two tablespoons of hollyhock herbs, you can create a great toner! Boil all of the ingredients together until the mixture achieves a thick consistency. Set it aside until cool and then apply all over your hair. After ten minutes, rinse your hair. Follow up with a sulfate-free shampoo and conditioner. Use this method no more than once a week due to the prospective drying that accompanies the use of apple cider vinegar. Editor’s note: Just like the apple cider vinegar, it has worked for me. For this, all you need is your existing shampoo, a teaspoon of baking soda, two drops of purple food coloring and two drops of blue food coloring. The shampoo provides a medium for the other ingredients to apply to the hair, the baking soda lightens, and the food coloring combats brassy tones (it’s all about color theory, folks). Simply mix the ingredients in a bowl with a bit of water and then dampen your hair. Once your hair is wet, apply this shampoo mixture like you’d apply any other shampoo. Wait five to ten minutes before rinsing and then condition your hair as you usually would. Do not use this recipe on your hair more than once a week. Baking soda can be incredibly drying! Editor’s note: My ears neck and face turned purple. Did my brassy hair change his tone? Yes (it became a bit purple also). Did I like the final look? No. Even brunettes can be bothered by brassy tones in their hair. If you find yourself in such a predicament, consider adding cool tones via food coloring to the conditioner that you use daily. You can use two drops of green food coloring (2 drops of green and 1 of blue if you have more orange tones) in your conditioner as a makeshift toner. After shampooing, apply the mixture to your hair and let it sit for ten minutes. Rinse and enjoy your cooler-toned brown hue! Editor’s note: I turned purple and didn’t see any change at all. When I knew I was going to be coloring my hair purple, I knew that some toning would be necessary. Fortunately, I had more hair coloring than I needed, so I was able to fashion a makeshift toner with a small amount of the hair coloring and my ordinary, white conditioner. I used Arctic Fox brand purple color and a generic, inexpensive conditioner. Simply dispense as much conditioner as you think you’ll need to cover your head into a bowl. Proceed to slowly add small amounts of purple coloring agent while mixing with a color application brush. Do this until the conditioner has turned a very light shade of purple. After all, you don’t want to deposit purple into your locks! Apply to wet or dry hair and let it sit for at least ten minutes. Rinse as you normally would rinse your conditioner and enjoy the nice, cool tone of your tresses! Editor’s note: My hair looked purple, but the color was uneven. Not for those who don’t want some purple toned hair. Above, we discussed how awesome apple cider vinegar is at helping tone warm-hued hair. Pair it with purple food coloring, and you’ve got a brass-banishing double-whammy! All you need is around 2 and a half cups of apple cider vinegar and 1/8 of a teaspoon of purple food coloring. You can mix red and blue food coloring if you don’t have purple lying around, but make sure to add more blue than red. The color should be bright violet. After washing and conditioning your hair, pour the apple cider mixture over your hair, wait a few minutes and then rinse. It’s really that easy! Editor’s Note: The whole food coloring thing didn’t work for me. Although my hair became less orange, it turned purple and so did my arms, neck, and face. Let’s face it: toning products or services from the salon aren’t cheap. Over time, especially, the cost can get pretty steep. Using the natural ingredients found throughout your home is not only much less expensive, but also far more accessible than other methods of toning. 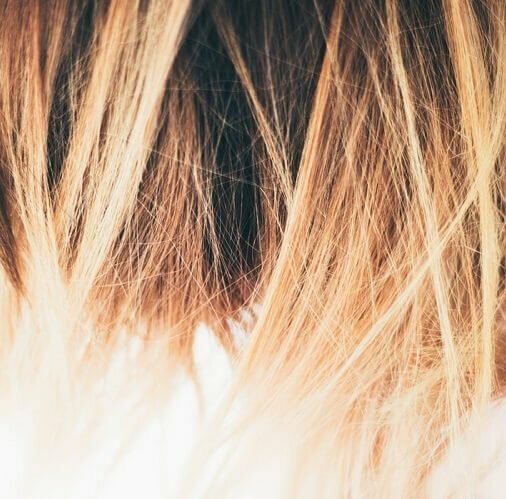 In this article, we’ve tried some of the most common homemade hair toners for brassy hair in-between our salon stops! I hope you found our Homemade Toner for Brassy Hair article useful. Do you want us to try any other homemade hair toner recipe?